Immanuel Orthodox Presbyterian Church is a new church in Medford, New Jersey with a warm, family atmosphere and a passion for the good news of Jesus. 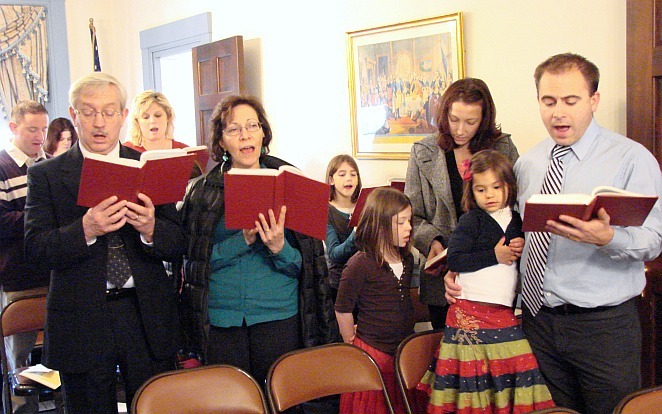 In 2004, the leadership of Immanuel OPC in Bellmawr decided to send forth a committed group of families to begin a new church in the growing area of southern Burlington County. This new work was designated Immanuel Orthodox Presbyterian Church of Medford, New Jersey. The goal was to provide a place where people of all ages and backgrounds can learn about the Savior Jesus Christ and worship Him as Lord of all. Weekly morning worship services began in April 2005. A month later, a Sunday School for all ages was launched. In the fall of 2005, an evening worship service was added. Immanuel was officially established as a new and separate congregation of the Orthodox Presbyterian Church in the fall of 2007. Immanuel Church is joyfully grounded in the biblical doctrines of the Protestant Reformation. We believe the Bible is the Word of God and our infallible guide for faith and life. We gather every Sunday to hear the Scriptures, pray, and sing together. We rejoice in the power of the Gospel to transform our lives and those of our neighbors. We at Immanuel Church are glad that you are here. Whether you are a believer seeking to grow in your relationship with the Lord or are just interested in learning more about the Christian faith, we invite you to gather with us this week.